Due to the worsening of my symptoms I have been stuck in my house all week and most of that time has been spent in bed I haven’t felt up to much but with my Mum’s encouragement and support she has helped me to write some posts. Mum realises that blogging is a good distraction and gives me some purpose. I am so grateful for all of you that read, comment and like. I love blogging and as you know I love a freebie. The August editions are out but as I’ve been housebound I’ve sent my Mum out in search of any magazine freebies. There are quite a few out there apparently but due to my Mum having almost zero knowledge of beauty products, a dubious memory and poor reporting skills that led to her telling me, “one magazine had some nail stuff and another had what I think is lip gloss”. Faced with those insights I opted for the one magazine whose title my mum could remember – Cosmopolitan, as at least I knew I would like the magazine. I was pleasantly surprised when I found that Cosmo came with a lip gloss and that it was a New CID lip gloss. I have some New CID products already but it’s their lip products that I am most impressed with. I have two of their 3-in-one Lip Wands and they are amazing. The wands are in a long tube that splits apart in three ways to reveal a gloss, lipstick and lip-liner in matching shades. It could’ve been gimmicky but they are quality cosmetics that I can wear comfortably without exacerbating my dry Sjogren’s lips or making them look worse. Annoyingly I don’t think they do the wands anymore but thankfully their lip products are still of great quality if this gloss is anything to go by. New CID are great at their innovations (they have a light and mirror on their lipsticks to help with application) and with this lip gloss they have a new wand that rolls. The wand looks a little like a tiny paint roller and it kind of acts in the same way, the wand makes application smooth, quick and even and you can get good coverage with one roll, no need to keep dipping it in and out. The shade that came with the magazine is Strawberry Bon Bon and is a true a strawberry mid-tone pink. It keeps its colour on the lips and gives great shine, it is also very comforting on the lips just like their previous Lip Wands. 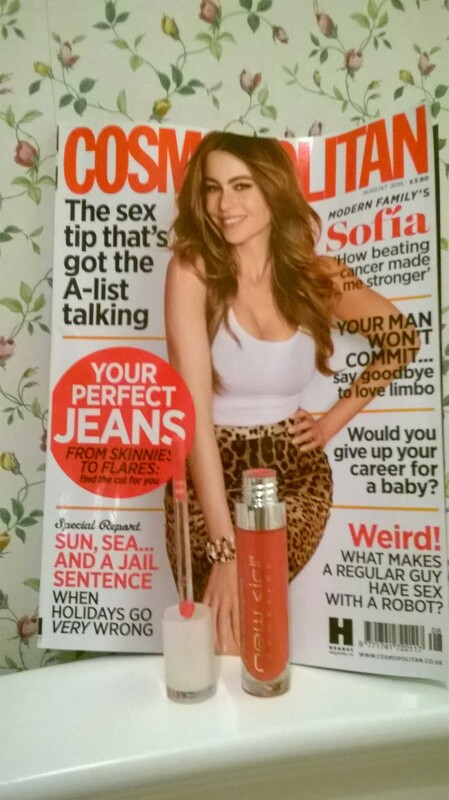 So pleased to get the New CID I glisten gloss and Cosmopolitan was a great read as usual. Hope you feel better! Mind checking out my blog? Thank you😊 and no problem! Good for you making the effort to keep going while you’re sick! Hope you feel better soon. I’m so impressed with how you use your down time (due to illness) creatively. It’s hard to have fun when you’re sick, but you’ve managed to find a way to do it. My hat is off to you. I hope you feel better soon.